If you are looking for an everyday 4x4 that offers luxurious specs, then our self-drive hire Porsche Cayenne S is exactly what you should hire from Signature Car Hire London. 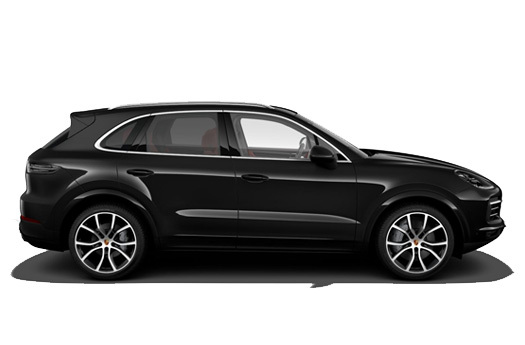 You can use the Porsche Cayenne S' plentiful power on normal roads and the S handles its weight easily and provides an agile driving experience. The third-generation Porsche Cayenne performance SUV offers drivers more technological features, a revised engine line-up and a cleaner, more luxurious interior than previous models. 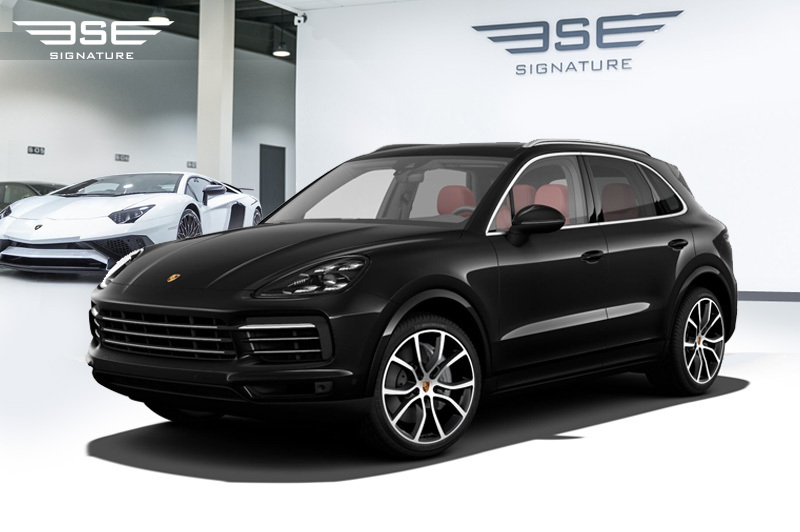 Our Porsche Cayenne S self-drive hire rental car is a sporty and desirable 4x4 which features a 2.9-litre, twin-turbocharged V6 petrol engine that produces an exhilarating 435bhp and 406lb ft of torque, pushed to all four wheels via an eight-speed ZF automatic transmission. The cars centre differential allows power to be divided between the front and rear axles, while a second differential at the back can split power between whichever rear wheel needs it most. The new Cayenne is lighter and weighs an average of 60kg less than the second-generation line-up which may contribute to the Cayenne S achieving 62mph from a standstill in just 5.2sec and a top speed of 164mph. There are three main factors contributing to the ability of our rental Porsche Cayenne S which includes its steadfast lateral body control provided by the chassis and trick air suspension, an ESP system that’s seemingly far happier to work with you than against you, and the ability of its four-wheel-drive system and Pirelli P Zero tyres to enable our rental Cayenne to cling to the road. 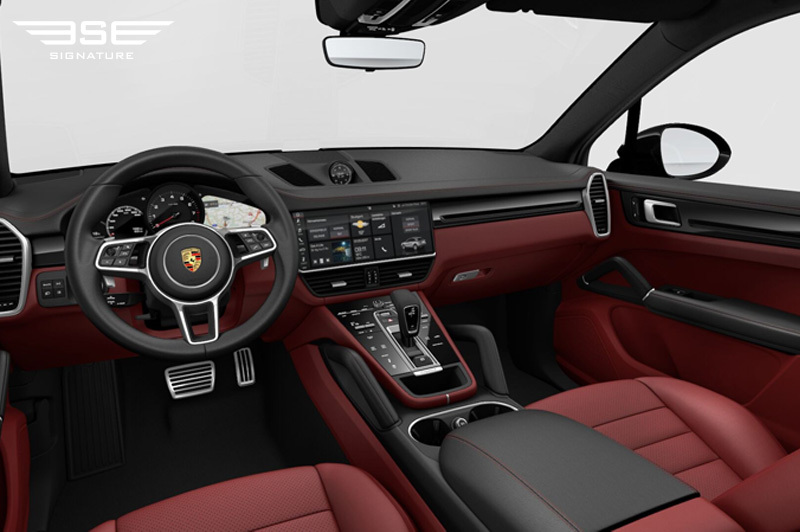 Equipped with the Sport Chrono Package, which includes a steering wheel-mounted drive mode selector, this model also has a launch control function, which is enabled by selecting Sport+. 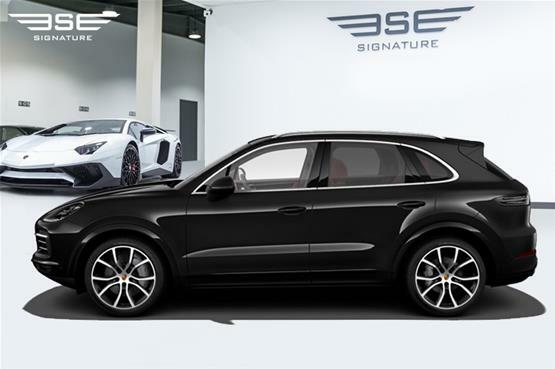 There's an impressive array of performance upgrades, including Porsche Dynamic Chassis Control, rear-wheel steeringand louder sports exhaust systems. This model also features 21in alloy wheels and new ‘surface-coated’ steel brakes as standard, the brakes getting a coating of tungsten carbide to improve stopping power and fade resistance and to reduce of wear. Traction off the line is impressive, as is the surge of acceleration that comes with it. There’s no apparent lag and movement through through the rev band is very smooth. Stopping ability is also impressive thanks to Stuttgart’s new white-calipered Porsche Surface Coated Brakes. The Cayenne S’s is confident on the road with bags of exciting abilities. 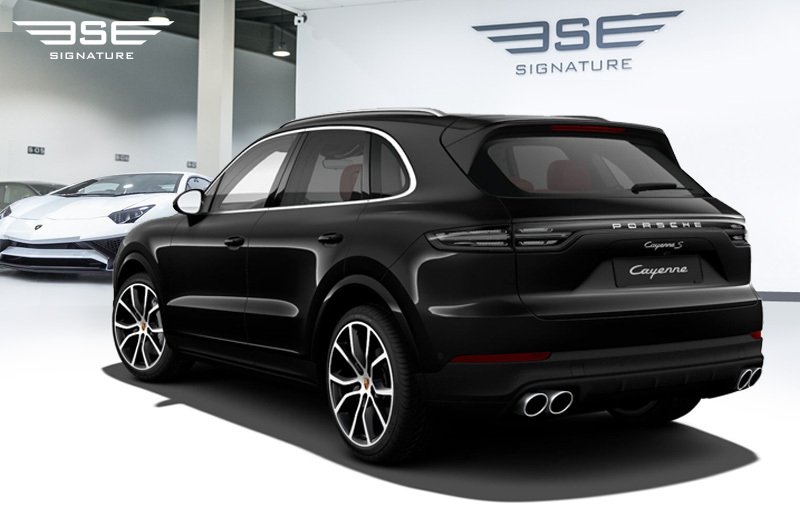 With the adaptive dampers set to comfort, the Cayenne S’s primary ride is generally very fluid and supple. Vertical travel and lateral roll are kept in line over uneven terrain and fast bends. Sport and Sport+ modes are great on smoother roads. 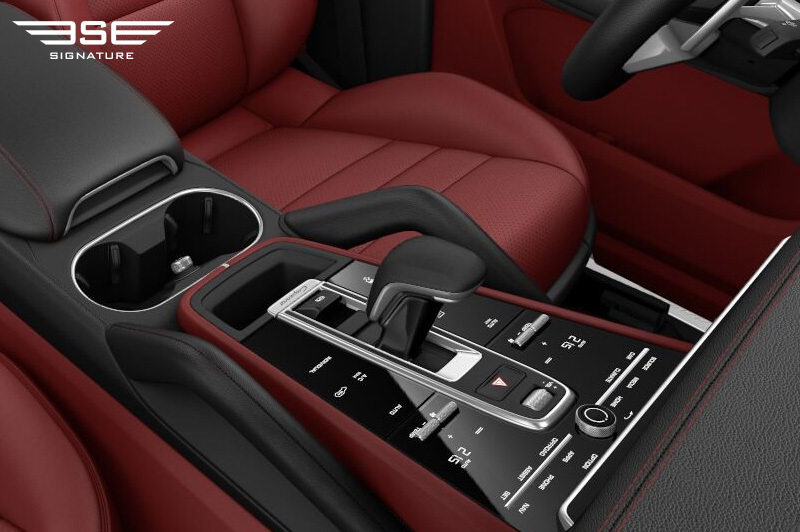 The steering is weighted positively and connects well with the front tyres. The front end reacts closely to driver input, while the combination of four-wheel drive and the tyres provide high levels of grip. 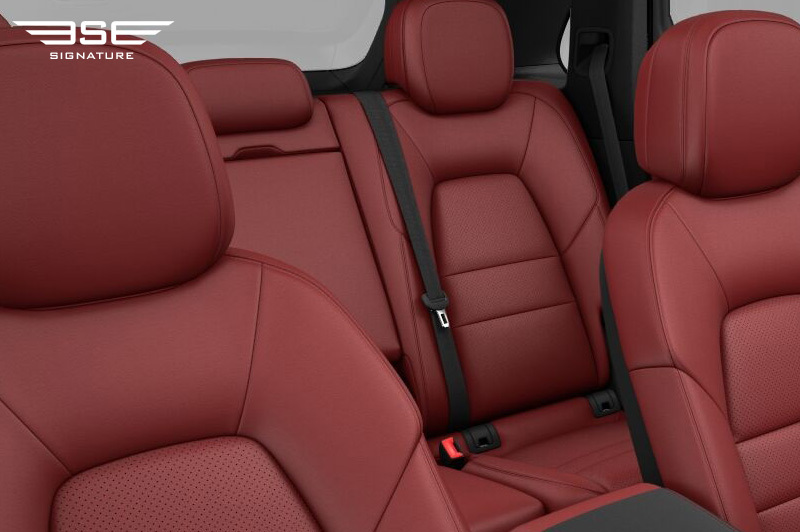 Comfort and luxury are not compromised, and our rental Porsche Cayenne S still has bags of composure and capability in challenging road conditions. 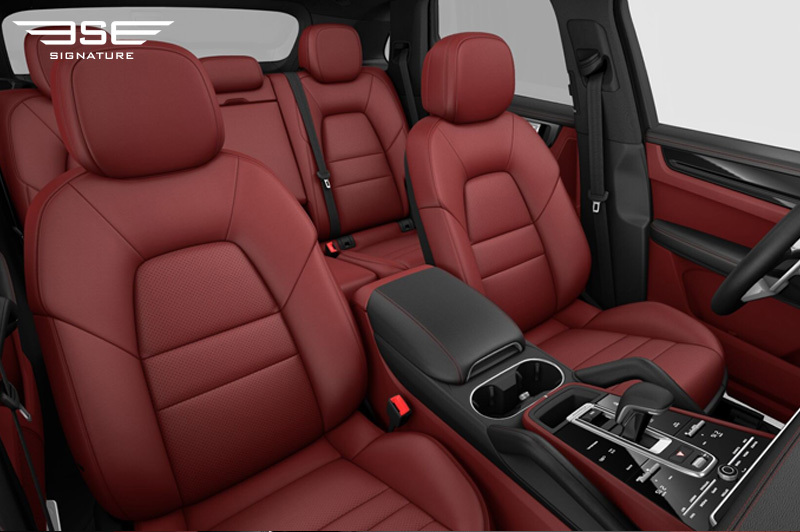 Our rental Cayenne S is luxurious and well equipped with heated front and rear seats, a big 12.3-inch infotainment screen. 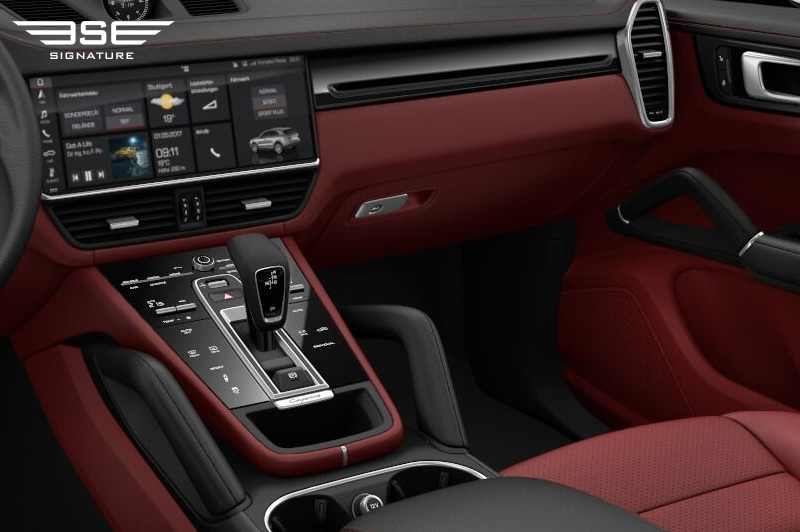 It also boasts a space-age feel thanks to a glossy centre console with touch-sensitive buttons.The cabin is spacious and handsomely appointed with all the mod cons you’d expect including sat-nav, Bluetooth, DAB radio, Apple CarPlay, Android Auto and more. The SUV’s instrument binnacle still retains a physical tachometer front and centre, but it’s now accompanied by superbly crisp variable digital readouts, and the central touchscreen is integrated smoothly into the slim dashboard. 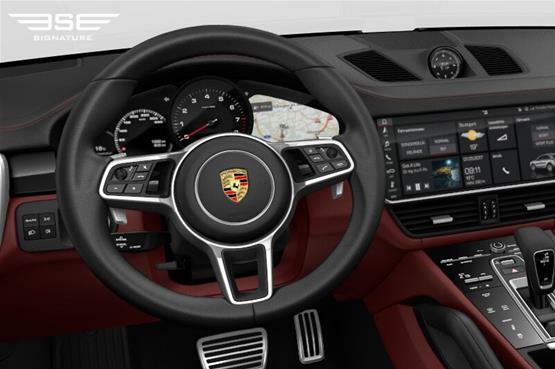 This is the latest incarnation of the Porsche Communication Management system and it is set up to function much like a smartphone, with app widgets pertaining to media and navigation, various operating parameters for the car and performance collated on a customisable homepage. The graphics are terrifically sharp and there’s barely any discontinuation following commands. There are also two USB ports in the centre console compartment, with two more located in the rear. This model has a cosseting and spacious cabin, and is quiet too. 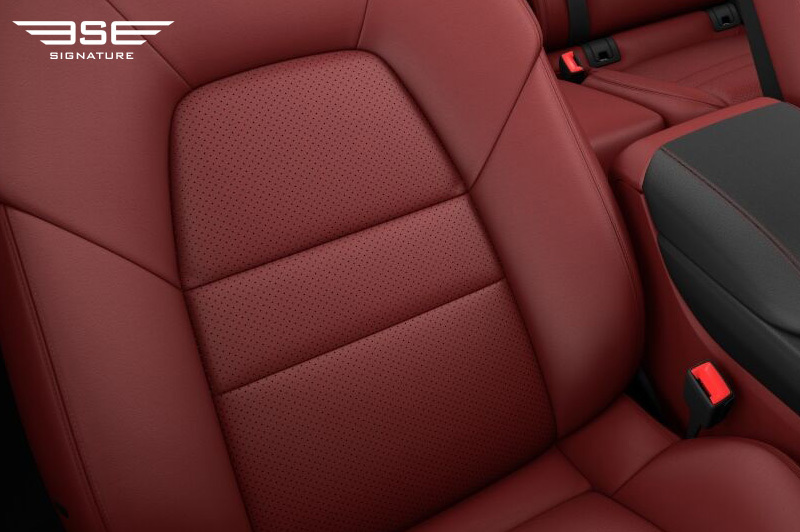 Head room across the second row remains generous, thanks to the lowered seating position which compensates for a more athletic roofline. The boot offers a significant improvement in volume over previous model’s. 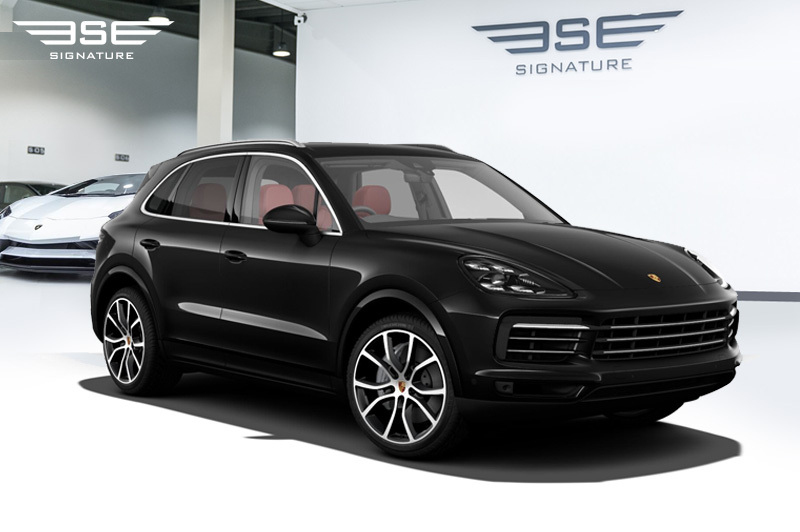 To rent this Porsche Cayenne S on a self-drive hire basis in the UK, call Signature Car Hire on 40207 118 2244 today.